The red blood cells serve the crucial function of carrying oxygen to the cells in the body and picking up carbon dioxide. Anemia is a condition that arises when the number of red blood cells falls below normal values, or the red blood cells function improperly. There are many diseases and conditions that can cause anemia in cats. A low red blood cell count can be the result of blood loss, the destruction of the red blood cells, or an inadequate production of new red blood cells. When your cat has IMHA, it means her immune system destroys its own red blood cells. Your cat’s body still produces red blood cells in the bone marrow to replace the destroyed cells, but once they are released into circulation, the immune system mistakenly recognizes them as something foreign, like a virus or infection, and destroys them. This condition is also referred to as autoimmune hemolytic anemia (AIHA). With primary IMHA, your cat's immune system mistakenly produces antibodies that attack its own red blood cells. This condition is fairly uncommon in cats. With secondary IMHA, the surface of your cat’s red blood cells is modified by an underlying disease process, drug, or toxin. Your cat's immune system identifies the modified red blood cells as something foreign and destroys them. When too many red blood cells are destroyed and not replaced quickly enough by bone marrow, the patient becomes anemic. These symptoms can vary from cat to cat and depend upon the underlying cause of IMHA. In some situations (mild or early IMHA), your cat may present no signs at all! When a cat is anemic, it is important to identify the underlying cause. Your veterinarian may recommend different tests depending on your pet’s symptoms and history. Treatment of IMHA depends on the severity of the condition. 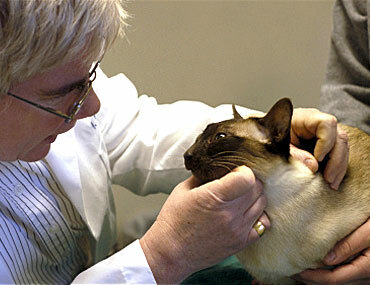 Your veterinarian will determine whether your cat needs intensive care or can be treated as an outpatient. Treatment often includes a variety of drugs and close monitoring of your pet’s vital signs and laboratory values. With secondary IMHA, treatment of the underlying cause is critical for recovery. Your veterinarian will recommend blood and other diagnostic tests including radiographs and ultrasound to try to determine if your pet’s IMHA is primary or secondary. If the underlying cause can’t be determined, your veterinarian may recommend treating your kitty with an immunosuppressive therapy. Your veterinarian may also recommend you see a specialist to help outline the best treatment plan possible, particularly if your cat requires 24-hour monitoring or specialty testing. The prognosis of a cat diagnosed with IMHA is dependent upon the underlying cause, the severity of disease, and the stage at which the disease is diagnosed. Your veterinarian can best help you understand your pet’s prognosis based on her specific diagnosis, overall health, and history.